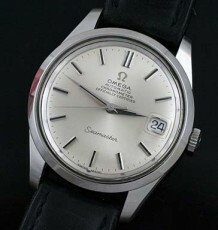 Omega vintage Seamaster Deville model from 1967. 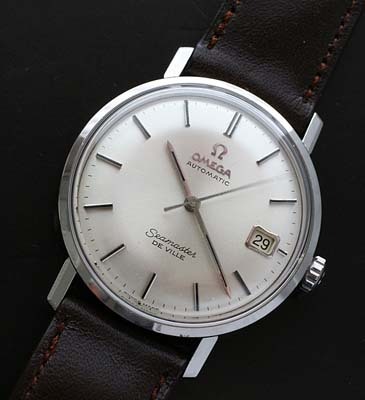 One of the nicest vintage watches around, the Seamaster DeVille with Date in stainless Steel, dating to 1966. The original silver white Seamaster dial features stick markers with ebony inlays against the light dial for easy legibility. 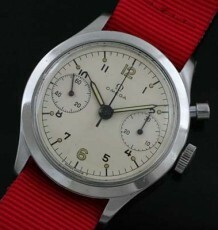 You will also note the original satin radial finish on the pristine dial. The larger Steel case is in very good condition and has the sought after Omega Seahorse Logo on the back of the very durable case. 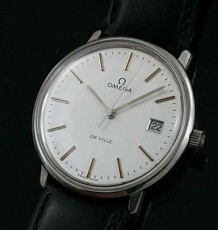 The original and correct Omega signed crown is till fitted to the watch. 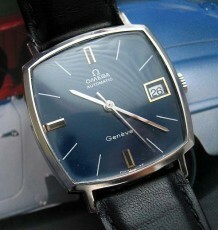 The 24 jewel Omega caliber 562 automatic wind movement was just serviced by my watchmaker and is keeping great time. This movement uses a full rotor automatic system, which differs from some of the earlier Seamasters that used a bumper wind mechanism. The watch is supplied on your choice of black or brown leather straps. The case measures 34.5 mm wide by 40 mm long.